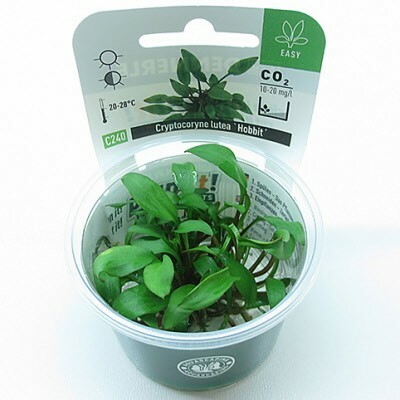 Native to Sri Lanka, Cryptocoryne lutea is one of the easiest species of crypto to grow. The new dwarf form, Hobbit, was isolated from a regular sized plant in the greenhouse and propagated in the laboratory. This variety is perfect for even the smallest tanks as its tallest height is only a few centimeters, or an inch or two. The speed of growth is also considerably slower than that of the stem form. With strong lighting, the leaves develop a deep purplish-brown tint and create a stunning contrast to other green foreground plants. In Vitro plantlets are shipped submersed in 100 percent humidity. Many aquatic plants available are emersed, which means the foliage is growing above the water. These plants die back when they are planted inside an aquarium, and they regrow leaves that have a different shape and size than they did when they were purchased. With InVitro submerged plantlets, you get stable, uninterrupted growth. Another benefit to the culture cups is that they have many tiny plantlets that can be separated and spread throughout your aquarium, so you get great value for the price.